These lines from Langston Hughes’ poem “Dream Deferred” lend this book its title and lay the groundwork of a play that, 57 years after Hansberry had it published, still echoes true in a world that is different from the one in which she wrote it. The play opens at the residence of the Youngers; a Black family that lives in the South side of Chicago and awaits a cheque with anticipation that would be palpable on stage. Their breadwinner having passed away, this cheque is the next step in life for a family that escaped the South; his life insurance cheque. For Mama, it is a mean replacement for the man she lived with for many years while for each of the other adults in the family, this cheque presents a chance for them to fulfil their dreams. The Youngers live in a small apartment in conditions that are appalling and it’s no wonder that they all seem to have invested so much of themselves in a piece of paper. The cheque comes to represent, on some level, the older Mr Younger embodied. A sort of sacrament for the fulfilment of his family. Money is definitely a significant issue in this play. Making it, spending it, squandering it, anticipating it. In a time when the global economy is a shambles, it’s certainly relevant. The Youngers’ talk of money would be vulgar in the eyes of the elite but it will be very familiar to those people who sense that their life has transformed into a struggle to survive, let alone progress. The promise of money that lingers in this play is particularly poignant as it progresses. At once a tool for hope and despair, Hansberry managed to paint a picture that encapsulates all the various ways in which it comes to represent so many different things to each of the members of the household. Race and money merge to present us with a picture of what it means to strive and what breaking away does to those who manage to escape from poverty. The ‘uppity’ black man is encapsulated by George, a young man who views all things Black with disdain. He is the true embodiment of the feeling of the oppressed that might is right. Hansberry juxtaposed him beautifully against the lone African character in the play. Eager to lead his country to freedom, the hope he has contrasts sharply with the hopelessness felt by Walter, the younger Mr Younger. The Black experience is not a linear experience. In one house-for that is the only place in which this play occurs-all the various permutations of what exactly it means to be Black are queried and spoken of in the language of the man on the street and that of those we have grown to know as the Black Panthers. From an African perspective, it is particularly shuddering how much Hansberry saw into the future. As Asagai, the lone African character, speaks to the Americans you can hear his lofty positions. His country may be part of the Empire but he has pride. In a searing monologue, he looks into the future and foresees the fate of Lumumba and the tragedies that were visited upon the people on the continent in the wake of independence. This issue puts hope in perspective; should it be unfettered or would limiting it be a denial of the very freedom of the people? The women in this play present a microcosm of society. Women are treated as second class citizens in society and sustain this in their own lives. Hansberry shows that it might be true that women are their own enemies but this play also shows the sisterhood of women in a very beautiful way. Banding together to develop themselves and their own, they do it in a way that is uniquely female. Ruth Younger’s predicaments distill those of so many women and the solutions that are developed in the time of the play are a model of female strength rarely seen on stage. This doesn’t mean that men are relegated to the back burner. Rather, they are shown in all their complexity with the strength and influence of women a significant theme. Hansberry wrote a play that celebrated feminism before it had a name. There is a direct line that links the thoughts of the three women in the Younger household. Women who are vastly different-one Southern, one a domestic worker, another young and educated-show the true nature of feminism. Set in a country that went on to treat the feminist ideal as a White ideal, it is a reminder to the world that the development of self and the liberation of the mind and body are human and to limit the experiences of any one gender is to subtract from humanity. Set in a changing world, this play retains its freshness for that very reason. Even as things change, they truly remain the same. Ambition and aspiration are common denominators of the human experience. Written when Ghana was the only independent ex-colony in Africa, its telling of the desire for freedom rings true today in the wake of the Arab Spring and with the recent coups in some parts of Africa. So many things about this play reverberate in a world vastly different from that in which Hansberry lived and died. Women, Black people and the residents of the African continent have made significant gains but so much is yet to be done and achieved. The soaring end of this play is hope as we have not been taught to expect. Not ‘happily ever after’ but living to die another day. At times heart-rending and entertaining, this is a classic play. Our deepest gratitude to Nyambura Mutanyi for allowing us to repost this article. You can find further posts from her work here at cmutanyi.wordpress.com. Nina Simone died in 2003, at age of 70. Unquestionably, she was one of the most compelling and ground-breaking musical figures coming from the United States. Nina highly believed that music had a strong political purpose. When we listen to Nina Simone, we cannot but notice her proud voice, engraved with the authority of an high priestess. In almost every song she is able to take us to the dimmer reaches of emotions, wandering from a bitter imperiousness to private torments. She was born Eunice Kathleen Wymon at Tryon, North Carolina, on February 21 1933, the sixth of eight children who grew up in poverty; their father was a handyman. By the age of three she could play the piano by ear; it is said that she was discovered playing, note-perfect, “God be with you till we meet again“, in the key of F, on the family’s organ. Nina Simone was not an instant success, but in 1959 her first album, “My Baby Just Cares For Me”, produced a gigantic hit in her version of Gershwin’s I Loves You Porgy. The triumph of albums such as “Wild Is The Wind” allowed her to assume a prominent position within the civil rights movement and she developed close relations with eminent figures of the time, such as Lorraine Hansberry, who she dedicated the song “To Be Young, Gifted and Black” and Stokely Carmichael, later known as Kwame Touré. During this turbulent period, Nina Simone is recalled to say that “America was my Daddy and he got under my skin.” Gradually her sound deliberately assimilated a gospel edge and famous work of black, notably Langston Hughes’s “Backlash Blues”. She felt that black politics accounted for circumstances she had partially understood since childhood – the different worlds, for instance, when she had crossed the tracks to visit her white piano teacher. She declared then, that while love songs had been her principal inspiration, there was a love that superseded it, the one that could bring her people together to secure their rights. “Mississippi Goddam” was an enraged reaction to the deaths of four children in the bombing of a Sunday school in Birmingham, Alabama, in September 1963. Through the civil rights movement, Simone grew increasingly absorbed with African-American history, and a longstanding interest in Africa began, culminating in a close association with Liberia in West Africa. However by the mid-1970s the movement was reaching a crisis point. Many of its leaders had been killed, and the growth of a grassroots movement rooted in the working class failed to mature. Despite eight best-selling albums, Nina Simone, as many other black artists, had lingering money problems due to unpaid royalties. Increasingly disillusioned with American politics, she drew inspiration from Third World struggles, left the US, and lived in Barbados, Liberia and Guinea-Conakry before settling in France. 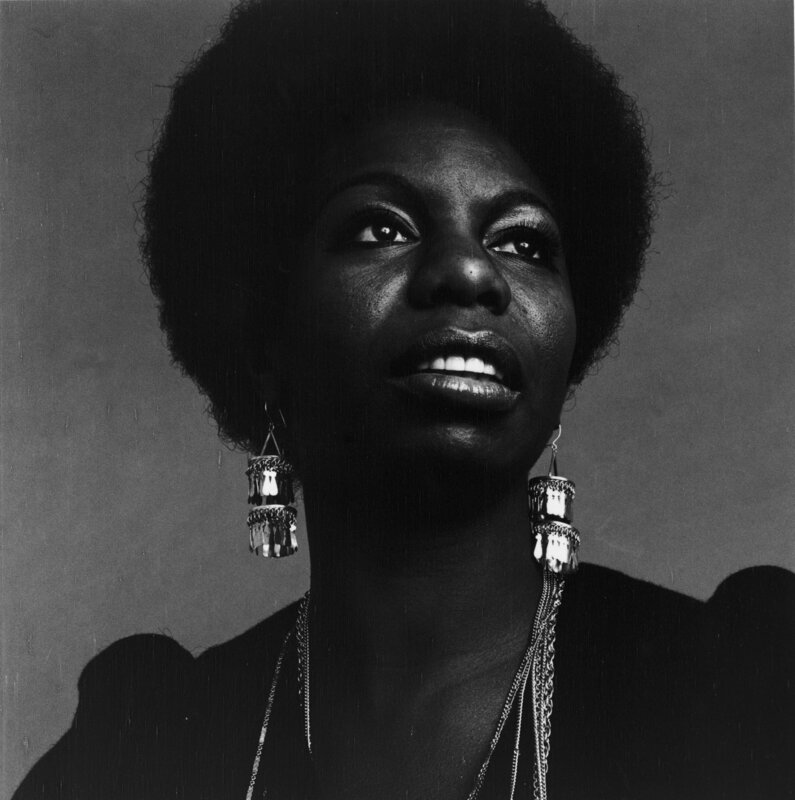 In the late 80s, Nina Simone took exception to the agreed distribution of the royalties from “My Baby Just Cares For Me”, which had become a belated pop hit. An infamous incident Nina allegedly chased a record executive from a restaurant with a knife. Moving to Aix-en-Provence in 1995, she received a suspended sentence for wounding an unruly teenage neighbour with a shotgun. Nina Simone left a wonderful legacy of music and song, and led an inspirational and political life, showing that great music comes from political commitment, not in spite of it.